This text integrates the issues of macroeconomics in a way that should make it easy for students to understand, including undergraduates. Both Keynsian and neoclassical issues are covered in this text so students get an overall feel of how economics really works. The text contains the same breadth of material as existing texts, but conveys a simple version of contemporary macroeconomics theory in the process. Laurence J. Kotlikoff, one of the nation's leading experts on fiscal policy, national saving, and personal finance and a columnist for Bloomberg, is Professor of Economics at Boston University. Auerbach and Kotlikoff tackle the most difficult (though necessary) aspect of teaching macro at the intermediate level, general equilibrium analysis, with an easy dexterity. Their book exhibits the rigor required of modern macroeconomic analysis, covers the most pressing issues of macro policy, and does both with clarity and grace. It's an excellent book. Auerbach and Kotlikoff put first things first in Macroeconomics highlighting long-term growth in output, productivity, and labor and captial input. They integrate a superb treatment of life-cycle consumption and saving into the neoclassical model of long-term growth. As one would expect, Auerbach and Kotlikoff offers a comprehensive, innovative, and logically consistent synthesis of the major questions of macroeconomics. Particularly impressive is their attention to the long-run determines of saving and growth in open as well as closed economies. Auerbach, Alan J.; Kotlikoff, Laurence J. 5. 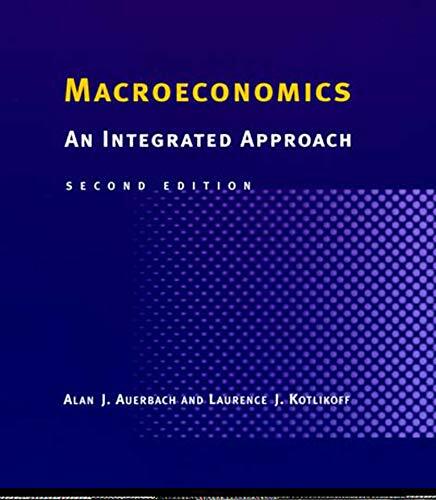 Macroeconomics: An Integrated Approach Auerbach, Alan J. and Kotlikoff, Laurence J.
Macroeconomics: An Integrated Approach Auerbach, Alan J. and Kotlikoff, Laurence J.